We received an email recently from Mary Ann Sheller Carter, a 1961 graduate of Wells College in Aurora, New York. She was vacationing in Mexico a few years ago when she serendipitously ran into an old college friend, and she’s met more Wells alumnae there since. 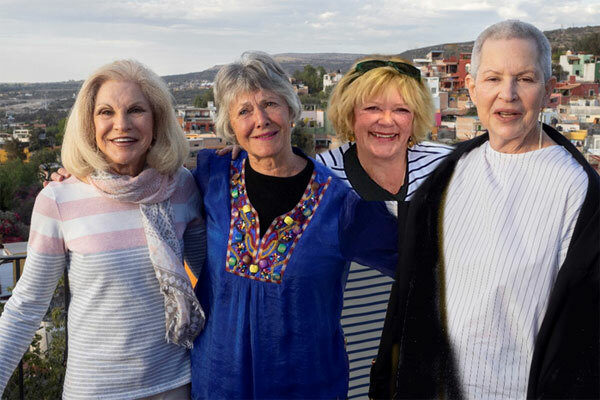 A group of “Wells Belles” reunited in Mexico this past February, and Mary Ann says the Class of ’61 is planning for their 60th reunion in a couple of years. We’re posting her story to show you what a small world it is and just how strong the connections and friendships you make in college can be. Thanks for sharing, Mary Ann! A few years ago in San Miguel de Allende (SMA), my husband Ian and I were waiting in line to see a movie. Two lovely women in front of me were chatting, and one of the voices sounded very familiar. I quietly said, “Linda?” She turned around and said, “M.A. !” There was Linda Glick Conway, Class of 1961, standing in line in front of me in Mexico! She invited Ian and me to her home for cocktails that evening, and we met several people who have since become friends. Ian takes numerous art courses in SMA. In one of the courses, two women draw and paint capillas around the campos or small country churches the indigenous people still use. The women became friends through their similar interests. Ian bought their book and realized he had painted a few capillas they had not seen. One of the artists, Linda Whynman, invited him to join her and her coauthor one afternoon to discuss their artwork. As the conversation progressed, they discovered that Linda and I both attended Wells: Linda Wilson Whynman ’66 and Mary Ann Sheller Carter ’61. So here are, four Wells graduates connecting in SMA in February 2019! We think it’s amazing that after all these years, the lasting friendships we made at Wells are resurfacing and deepening, and new ones being discovered. Start looking for your future alma mater here on CollegeXpress.